International growth, buybacks, and a growing portfolio of winning franchises could pay off nicely in the years ahead. Shares of Viacom (NASDAQ:VIAB) fell just over 2% last week after the company reported third-quarter results that disappointed Wall Street. The decline continues a year-long losing streak for Viacom stock, but there are reasons to believe the stock could rise. Revenue declined 7% to $3.421 billion in the quarter. Operating income remained mostly flat at $1.086 billion and per-share earnings from continuing operations rose 10% to $1.42. Analysts surveyed by S&P Capital IQ were expecting $3.539 billion and $1.43. Revenue at the Media Networks segment responsible for Viacom's cable TV holdings rose 1%, not enough to offset a 26% decline at the Filmed Entertainment group. Generally, Media Networks accounts for 70% of revenue and virtually all of Viacom's operating income. On a call with analysts, CEO Philippe Dauman cited lower ratings in key demographics and weaker-than-expected advertising demand as headwinds, though he also said Viacom positioned itself well for the quarter ahead. "It's been widely reported that this year's Upfront selling season was relatively soft, with most networks seeing decreases in volume as a few major advertisers held back dollars. While the market generally was indeed challenging, our Media Networks outperformed, and we grew volume in the low to mid-single digits over last year," Dauman said. Is Dauman right? After studying the report I see three reasons why current and prospective investors would be optimistic. 1. International growth. In May, Viacom announced a $757 million deal to acquire Channel 5 in the U.K., the nation's largest privately owned public broadcaster reaching 42 million viewers. The goal? Add to a programming slate that's already performing well. (In 2013, MTV enjoyed its highest U.K. ratings in eight years.) AMC Networks (NASDAQ:AMCX) is taking a similar approach by rebranding the MGM Channel it acquired in a $1 billion deal for Chellomedia. CEO Josh Sapan plans to use the rechristened AMC international imprint to win viewers in new territories. For its part, Viacom plans to follow its unveiling of the Paramount Channel in Romania with a November debut in Latin America. Said Dauman on the Q3 call: "We've now launched 28 channels internationally since the beginning of 2013, and we will continue a steady pace of channel launches as we go forward and establish a platform for a much bigger international business." Overseas territories accounted for 26.4% of Viacom revenue in fiscal 2013, down from 29.3% two years earlier. 2. Stock buybacks. Viacom has what may be the film and TV industry's most aggressive stock buyback program, with $7.15 billion worth of repurchases still planned. Impressive? No doubt, though I should caution that buybacks don't always add value. Last quarter, for example, the company repurchased 10 million shares at $85 apiece. Viacom stock trades for $80.44 as of this writing. 3. The Teenage Mutant Ninja Turtles. Like Time Warner and Walt Disney, Viacom depends on strong brands to help drive profits. To add to a portfolio that includes Transformers, G.I. Joe, and cable properties such as MTV's Teen Wolf, in 2009, the company purchased the rights to Teenage Mutant Ninja Turtles. Today, that's looking like a smart move. Despite substantial competition from Marvel's Guardians of the Galaxy, the Teenage Mutant Ninja Turtles conquered the U.S. box office with a $65 million opening weekend. Worldwide, the film earned an estimated $93.7 million, Box Office Mojo reports. A sequel is planned for June 3, 2016. On the earnings call, Dauman said Viacom would build on that momentum by bringing 26 new episodes of the Teenage Mutant Ninja Turtles animated series to Nickelodeon while striking new licensing deals. Disney has a similar strategy with Guardians. 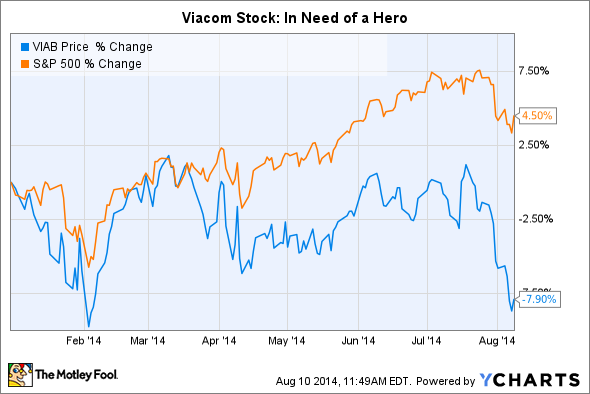 Viacom isn't an easy stock to own, as evidenced by its year-to-date underperformance. But it's also a big brand with meaningful assets, such as the Transformers and Teenage Mutant Ninja Turtles. Doubling down on those properties and then bringing them to new territories could pay off nicely. Mix in a generous buyback plan and you've an explosive formula -- one that could see Viacom stock soar.